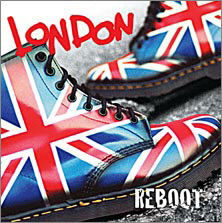 London put their best boot forward. Ciao! review by JOHN V. Original here. It’s not often these days that a new album hits me right between the eyes, but this did. Frankly, it’s the best thing I’ve heard in ages – just as I thought all the really good ones had been made long ago. London were a quartet formed at the end of 1976, made two singles and an EP which nudged the Top 50 the following year, and an album just as they were about to disband in early 1978. Thirty years later they were back, with new guitarist Hugh O’Donnell and drummer Colin Watterston joining lead vocalist Riff Regan and bassist/vocalist Steve Voice from the original line-up. Several gigs and an official live bootleg later, here comes the second album. And it really is magnificent. About 30 seconds of single-note feedback, gradually building up until the drums and bass kick in, open up the collection. When the Night Falls, a sadly almost-forgotten 1966 single by Freakbeat/early psych UK band The Eyes, is the only cover version to be heard. Controlled yet storming guitar and a powerful vocal from Riff, sounding uncannily like early David Bowie at times, makes for a great start. Pop, a three-second sort of instrumental (OK, a sound effect – they wanted to record the world’s shortest ever track), leads into Minute Man, powered by an almost ridiculously infectious guitar riff and tongue-in-cheek lyrics which I can’t say much more about on a family-friendly website. It’s similar in feel to Status Quo at their most urgent, or even classic mid/late-60s Who, Move, Rolling Stones. Every Dog is more relaxed, with added colour courtesy of 12-string guitar, a tambourine accentuating the drums, and a slight nod to The Jam in ‘That’s Entertainment’ mode. A chugging guitar intro reminiscent of early U2 kicks off Rebecca, a tale of ’A girl I know, flame red hair, gets hearts beating, drives you to despair.’ By the time it reached the short but sweet and gutsy guitar break, I was starting to think Quo’s ‘Paper Plane’ – although this one uses more than three chords! The pace continues likewise with Animal Attraction, which was conjuring up memories of the Undertones, Buzzcocks, the Boomtown Rats (at their early best, mind). Musically it’s given an extra lift not only by the basic hook, but also – one for the guitarists among you – the way the tune effortlessly moves up one pitch with each succeeding verse. Like It Never Happened will instantly have those of us of, er, a certain age smiling at the lyrics. To some extent, it’s a song based around Steve namechecking everything he liked from years gone by - ’Small Faces – going places – feeling free – Simon Dee.’ (Own up, a few of you might just remember Mr D). An interesting drum pattern from Colin drives Celebrity Crash along – think of a cross between The Sweet’s ‘Ballroom Blitz’ and Golden Earring’s ‘Radar Love’. Combined with extra guitar parts laid down on a trip to New York by Hugh, who also taped some street sounds there that can be heard during the drum break, it’s quite an epic – and they take less than three minutes to say it all. Standing Alone is the real surprise on this album, not to mention bringing with it a piece of musical history. A ballad (yes, they can do it – they have) co-written by Riff, Steve and Hugh, with reflective lyrics, it adds a new dimension with trumpet and strings effects produced by a mellotron, an early analogue tape sampler superseded in the 1970s by synthesisers, but not before it was used by prog-rock deities King Crimson on ‘In the Court of the Crimson King’ and the Beatles on ‘Magical Mystery Tour’. And when I say it, according to studio logs, London were using the very same mellotron that those groups themselves used. The high energy rock’n’roll returns on Get Out of London, the lyrics in part an angry riposte to some fool who came to a gig when they were ’playin’ their home town and havin’ a blast’ and complained that the show was a farce. ‘Get Out of London’ was the retort, ’we don’t want you around...get out of this town today.’ Finally, 77 Dreams is another brisk, powerful buzzsaw guitar-driven number that ends on some dynamic feedback effects. An eight-page booklet designed by Hugh the guitarist containing a short biography of the band and notes about the recording of the album, plus a centre-spread of photos taken onstage, and an eye-catching pic of an astronaut on the moon – look closely at where his face should be, and you will see the band. Whereas their first album Animal Games (later reissued on CD with bonus tracks as ‘London - The Punk Rock Collection’) was basically punk with the odd slight deviation, this second album shows more of a progression towards more mainstream pop-rock. Had it been released ten or fifteen years ago when singles ruled, several tracks would have been obvious contenders, with Minute Man, Animal Attraction and Get Out of London topping the list. Take a few strong infectious hooks, ensure the adrenalin is there, and you can’t go wrong. These guys certainly don’t. I was lucky enough to catch the band at a recent gig in a packed club in – well, London, actually. They played about half a dozen of these tracks, alongside older material, and the result was a scorching performance which had the punters in the palm of their hand almost from the opening chord. It’s on a small indie label, so you’d be lucky to find it in the high street. Go online (well, who doesn’t buy CDs online these days? ), and you will be well rewarded. And if they have a gig at a venue near you, make sure you’re there on the night. Oh, and some of us can’t wait 34 years for the next album. Rumour has it that they won’t make us hang on that long, thank goodness. Meanwhile, enjoy this one! Eyeplug Magazine 2017 review by Mohair Sweets. Original here. Considering it was thirty-plus years since London had called it a day this release is nothing short of remarkable. Fair dues only Riff (vocals) and Steve (bass) remain from the original band, but they’ve managed to keep the feel and the sound of the late seventies line-up and recordings. Well, maybe it is a tad more ‘hi -fi’ compared to the technology of the punk era but, the bite, spite and spit (only joking) are fully intact. New boys Hugh O’Donnell (guitar, replacing Dave Wight) and Colin Watterston (drums, replacing Jon Moss) are a perfect fit. O’Donnell possesses an absolute classic ’77 era guitar tone that is equal parts Thunders/Jones with the main vein buzz-saw of countless others like Marco Pirroni, Steve Diggle et al. Most impressive. Kicking off with the Creation-esque When the Night Falls the band then tackles – topically at least – sexuality, failed (and questionable) relations, success, failure, nostalgia and celebrity with musical smatterings of acoustic, garage/freakbeat riffage and plenty of good old three (or possibly four) chord punk. 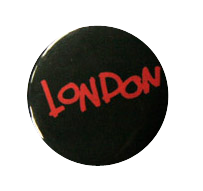 Y’know like the kind they used to make back when London first appeared on the scene. Nice. Vive Le Rock! review by Scott Zverblis. Original here. London, the underground punk act from Britain's second wave, reunites after 34 years with half of its first-album line-up intact; Riff Regan (vocals) and Steve Voice (bass). Hugh O'Donnell (guitar) and Colin Watterston (drums) fill in the gaps. You have to wonder what would inspire 50-year-old blokes to dust off their instruments and shout about the world's problems like nothing had changed since '78. Nevertheless, things come off pretty well for the band, who were once managed by legendary music manager Simon Napier-Bell, and it's amazing to think that, even after all these years apart, the band can record a fairly decent album. However, knowing the current climate of the music charts – saturated with guys with laptops - ‘Reboot’ may not get the amount of record sales that it deserves, which is a real shame. Rating: 6/10. London The Punk Rock Collection reviews here.